News, stories and information to help you love Loja as much as we do! Noticias, historias e información para ayudarte a amar a Loja tanto como nosotros! A few months after we started the Free Walks Loja tour project in town, there was a huge festival happening in the city. This is the "Festival de Artes Vivas" (Live Arts Festival) that is celebrated in Loja every November for about 10 days. At first, as is usual in every entrepreneurship, we didn't have many customers so we decided to look for them while delivering leaflets in the streets. That's how I ran into Susy and Ron, two retired people visiting our town who were struggling with their Spanish. I told them about our free walking tour in Loja, and Ron asked for more information. I said we visit the Concepcionist Nuns Museum, the Music Museum, Loja's main squares, churches and, at that time, we used to offer a wine tasting experience at the end of the tour instead of the coffee tasting that we offer now. On Friday July 27, 2018, I got a call from Hotel Villonaco in Loja to help some visitors from Perú with a private guided tour. The people from Perú called me at 8 or 9 pm after getting the Free Walks Loja leaflet at the hotel, and I went immediately to talk with them and help plan their tour. At the hotel I met the father of the family. 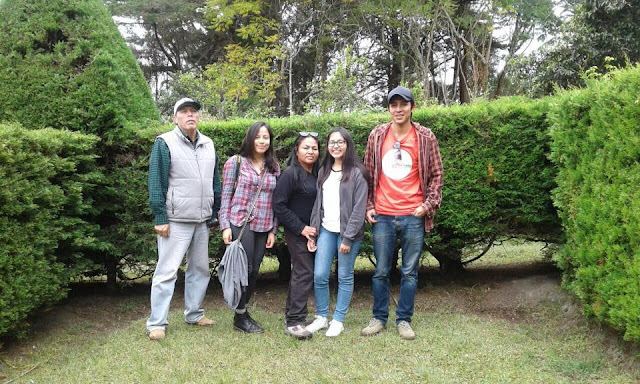 He was a very kind businessman who came to Loja to have a vacation with his wife and two daughters, but also to make some connections with people from Ecuador to expand his business. This man works with an enterprise which produces natural food products in Trujillo, Perú. It's not the first time we have toured visitors from Perú who are looking look for possible business partners in Ecuador. 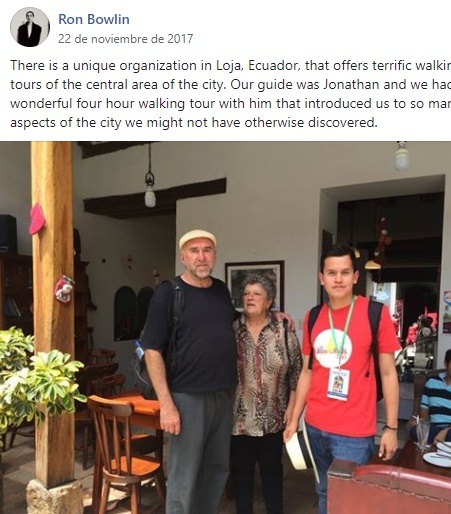 As soon as I understood all of his expectations for his stay in Souther Ecuador, I prepared a 4 day tour for him to Loja, Vilcabamba and Zamora. We WIN in Las Vegas! A few months ago two women, one from from Las Vegas, and one from México, took the Free Walks Loja tour with me. I had a really good tour with them because we were all willing to share our experiences about trips we'd taken to different parts of the world. Instead of having a typical tour with me explaining different aspects of Loja, we became good friends while talking about our lives. Sometimes the best tours are the private ones with very few people. We finished our walk in Loja with a coffee tasting stop, which both visitors loved. When we finished our coffee, the ladies gave me a tip for taking them on tour, and they invited me to hang out that night. We went out to one of the city's free Jueves Cultural concerts, and then we went for a beer where there's a nice view of the city. It was a wonderful night and I knew the next day they had to start their return to Las Vegas and to Perú, respectively.